In uniforms, fabric is everything. Choose a fabric that’s too heavy, and your employees will be uncomfortable and hot. Choose a fabric that’s too lightweight, and your uniforms might not last very long. That’s why choosing the right government uniform fabric is crucial. Below are a few key things to keep in mind about each type of fabric as you’re making your selection. All natural fibers offer breathability. Soft hand and easy drape on the body. Strong fibers that stand up to wear and tear. Fibers have more “give” than natural fibers allowing comfort and movement. Processes faster through all wash cycles. Fibers deter dust and debris. Poly rich fibers deter dust and debris. Breathability and comfort of cotton. Strength and durability of polyester. Our Account Management Team can help you select the right fabric for your government uniform program. Click here to get started and learn more. When selecting uniforms for government agencies, the single most important factor in fit, comfort, safety and durability is uniform fabric. To help you sort through the bevy of fabric options, we’ve compiled a list of the fabrics most commonly used in government uniforms, and briefly discussed the positive and negative aspects of each. Natural fabrics have many advantages. Because they drape and fit well, they are usually more comfortable than synthetic fabrics. They absorb perspiration and are typically hypoallergenic. Natural fabrics are also environmentally friendly because they are 100% biodegradable. Cotton is lightweight for comfort, breathability and easy care. It is soft and strong, but does wrinkle easily. It is often blended with other fabrics to increase its wrinkle resistance. Wool provides a crisp, professional appearance. It is warm, absorbent, durable, breathable and wrinkle resistant. It has flexibility and elasticity, which helps it retain its shape and respond to the movements of the wearer. Synthetic fabrics are produced to have distinct properties. They are often more economical than natural fabrics. Polyester offers durability, affordability and easy care. Fibers have more “give” than natural fibers, allowing for comfort and movement. Polyester deters dust and debris, has excellent color retention, and does not shrink. It does not absorb moisture, so it can be hot in warmer temperatures. Acrylic imitates wool. It is lightweight, soft, warm and very durable. It is resistant to wrinkling, soiling, shrinking and fading, but can have problems with piling and abrasion. Spandex has excellent shape retention and is highly flexible. It is lightweight but very strong, and provides comfort and durability. Fabric blends are two or more types of fibers twisted or spun together. They typically enhance the quality of the final product by combining the positive elements of each type of fabric. Polyester/cotton blends offer the breathability and comfort of cotton with the strength, durability and wrinkle resistance of polyester. These blends are lightweight and offer excellent color retention. 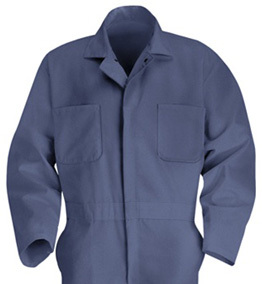 Polyester/wool blends are durable, comfortable and provide an appealing fit. Wool/cotton blends provide enhanced comfort, appearance and performance. No matter what a fabric’s pros and cons are on paper, the best way to see how a uniform will look and feel is to actually see and feel the garment. Request uniform samples or fit sets to get a true picture of the fit, durability and comfort. Confused by all the uniform fabric options? Our Account Management Team can help you select the right fabric for your government uniforms. Click here to get started and learn more.